Brenda Eickerman (left) and Jamie Scott opened the Mascot in early December. Nestled amongst buildings of industry, and conveniently close to the Gonzaga University campus, the Mascot Pizza opened its doors early this month hoping to become a new community gathering place in the low-key neighborhood. 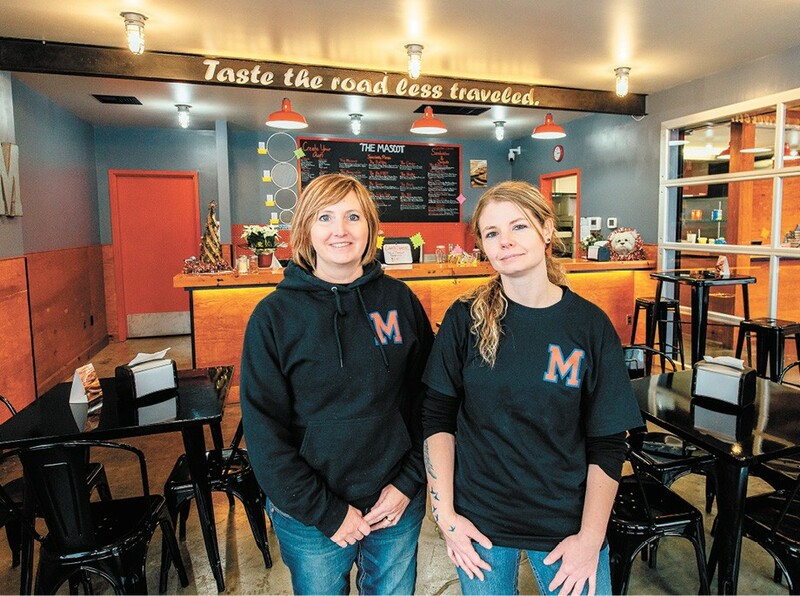 Owners and business partners Brenda Eickerman and Jamie Scott have decades of pizza experience between them. Last Christmas, Eickerman's uncle turned down their half-joking request for a building in Coeur d'Alene, yet had another spot in mind for the pair: Mascot Pizza's building formerly housed the now-shuttered Ramblin' Road Craft Brewery, a block north of No-Li Brewhouse. Eickerman and Scott's experience in the restaurant business started with River City Pizza in Otis Orchards. "I started there in high school and just never really left," Scott says. "I always wanted to own my own business, and I haven't really done any other restaurant work other than pizza, so it just felt natural to stick with what I knew." In addition to the pizzeria, Scott works part-time as an echocardiographer. Eickerman's family formerly owned River City Pizza before selling it last year. A chalkboard menu lists 11 house-made creations; most of the pies' names reference regional high school and college mascots, including the Titan, Saxon, Scottie, Cougar, Bulldog and Husky. "We make our dough fresh every day, and nothing we use is frozen," says Scott. "We want a place that's not super expensive, and a place people want to come and hang out." The thin-crusted Titan ($21.50/large) is as foldable as a thin crust should be, and offers a sharp tang from the feta cheese and red onions. The Mascot ($21.50/large), meanwhile, is a robust pie of the pizzeria's hand-tossed dough, generously topped with a hearty mix of meats. Mascot's pizzas can be ordered as 8-inch-personal pies on up to large (16-inch) sizes, with prices for most of the large pies averaging just above $20. The menu includes a handful of sandwiches with full ($9) and half-size ($6) options, as well as appetizers and salads. Scott and Eickerman are still awaiting approval of a license to serve beer and wine, which they expect to be processed by the end of the month. Around that time, Mascot Pizza's seating capacity will increase from 49 to 80 when the other half of the building is ready. The restaurant also then plans to stay open a little later into the evening. With pizza offered by the slice ($2) on weekdays from 11 am-1 pm, workers and students in the neighborhood looking for a quick lunch will be pleased to have another option. The business is also working to accept Gonzaga's dining services currency, Bulldog Bucks. For those who can't make it to the brick and mortar, delivery is free with a $13 minimum purchase. The original print version of this article was headlined "Spirited Slices"